You will find below the horoscope of Olga Potachova with her interactive chart, an excerpt of her astrological portrait and her planetary dominants. If you know the time of birth of Olga Potachova, we would appreciate it if you would send us your information with your source, at stars@astrotheme.com. To thank you for contributing to the enhancement of our astrological database, we shall be glad to send you the astrological portrait (34 pages) of this celebrity. Horoscopes having the same aspect Venus square Pluto (orb 1°43'): Britney Spears, Hillary Clinton, Justin Timberlake, Jack Nicholson, Kris Jenner, William Shakespeare, Jennifer Love Hewitt, Yasmine Bleeth, Morgan Freeman, Silvio Berlusconi, Camila Cabello, Goldie Hawn... Find all the celebrities having this aspect. Horoscopes having the same aspect Sun trine Uranus (orb 1°49'): Julie Gayet, Muhammad Ali, Drew Barrymore, Chris Martin, Marie Curie, Liv Tyler, Anthony Hopkins, Marie Antoinette, Caitlyn Jenner, Dominique de Villepin, Rita Hayworth, Thierry Cabot... Find all the celebrities having this aspect. Celebrities being the same height: Teddy Riner, Kane (wrestler), Mikhail Prokhorov, Brad Garrett, Amaury Leveaux, Simon Shaw, Marvin Barnes, Dean Cox, Milena Boteva, Isis the Amazon... List of all the celebrities being 6' 8½" tall. Celebrities clicked on in real-time: 576,873,636 times. Olga Dmitrievna Potachova (Russian: Ольга Дмитриевна Поташова; born June 26, 1976 in Potsdam, Germany) is a Russian volleyball player. She was a member of the national team that won the silver medal in the Sydney 2000 Olympic Games. She is 2.04 m tall, making her one of the tallest female athletes in the world. She had to retire in 2004 due to health problems. Here are some character traits from Olga Potachova's birth chart. This description is far from being comprehensive but it can shed light on his/her personality, which is still interesting for professional astrologers or astrology lovers. 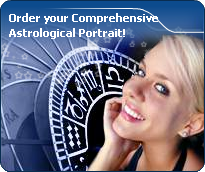 In a matter of minutes, you can get at your email address your astrological portrait (approximately 32 pages), a much more comprehensive report than this portrait of Olga Potachova. Warning: when the birth time is unknown, which is the case for Olga Potachova, a few paragraphs become irrelevant; distributions in hemispheres and quadrants are meaningless, so are dominant houses and houses' accentuations. Therefore, some chapters are removed from this part. Cheers for communication and mobility, Olga Potachova! The predominance of Air signs in your chart favours and amplifies your taste for relations and for all kinds of short trips, whether real (travels) or symbolic (new ideas, mind speculations). You gain in flexibility and adaptability what you lose in self-assertion or in pragmatism. The predominance of Water signs indicates high sensitivity and elevation through feelings, Olga Potachova. Your heart and your emotions are your driving forces, and you can't do anything on Earth if you don't feel a strong affective charge (as a matter of fact, the word "feeling" is essential in your psychology). You need to love in order to understand, and to feel in order to take action, to the detriment of a certain vulnerability against which you should learn to fight. Earth qualities are under-represented in your chart, with only 6.94% instead of the average 25%. Deficiency in Earth may indicate that you have no interest in material and concrete values. It is likely that you live too much in your heart or in your mind, or even in your enthusiasm! The fact remains that you may end up in tricky situations, due to your lack of good sense or forethought: material life is unavoidable even if you are rather idealistic, dreamy, or easily content. You must tackle concrete life necessities, for fear of... being forced to cope with them, later, in much more unpleasant ways! The Mutable mode is the most emphasized one in your natal chart, Olga Potachova, which indicates a mobile character that is curious and thirsty for new experiences and evolution. You are lively and flexible, and you like to react quickly to solicitations, but don't confuse mobility with agitation, since this is the danger with this configuration - and with you, stagnation is out of the question. Security doesn't matter as long as you are not bored. You optimize, you change things, you change yourself... all this in a speedy way. In your natal chart, the three most important signs - according to criteria mentioned above - are in decreasing order of strength Gemini, Cancer and Leo. In general, these signs are important because your Ascendant or your Sun is located there. But this is not always the case: there may be a cluster of planets, or a planet may be near an angle other than the Midheaven or Ascendant. It may also be because two or three planets are considered to be very active because they form numerous aspects from these signs. After this paragraph about dominant planets, of Olga Potachova, here are the character traits that you must read more carefully than the previous texts since they are very specific: the texts about dominant planets only give background information about the personality and remain quite general: they emphasize or, on the contrary, mitigate different particularities or facets of a personality. A human being is a complex whole and only bodies of texts can attempt to successfully figure out all the finer points. Olga Potachova, an enquiring intelligence, an instant understanding and a wide range of interests prompt you to go towards other people in all circumstances with a view to exchanging ideas and to show your talent for repartee. Ideas and actions must be quick and you are likely to be impatient, even critical and sarcastic with people who cannot match your frantic rhythm. You are very adaptable, you can do several different things at the same time and also think of a future action because you constantly need to be on the move. You may be criticized for your superficiality, for spreading yourself too thin and for your propensity to conceal the truth, but you always get out of tricky situations incredibly well because you are very astute, shrewd and charming. You are sensitive, vulnerable and tender at the same time, Olga Potachova. When you love, you give your entire affection and your partner may in all confidence rely on a long-lasting and reassuring relationship. You are so calm and so tender that you think that it is enough to win over your partner's heart, and you are often right. However, do not mix up giving and receiving. You so deeply need to receive love in return that you may be too passive and in the long run, as you become demanding, you may show immaturity. Security and sustainability in your relationship are of utmost importance. Your family also is important, it is the refuge, even the sanctuary, where you like you hide when things go awry. You also dream of love, may be too much, and it may be detrimental to what might be concretely experienced if you were more dynamic or less fearful to get hurt. However, remember that you receive only as much as you give. What an energy, Olga Potachova! You take so many initiatives, you have so much strength for action, construction and struggle! You are part of the conquerors, loyal and concerned about panache. Your vitality is such that you can achieve your objectives and release all your creativity. However, you are so proud and so unyielding that you cannot tolerate the faintest annoyance on your way: if you are vexed, you may turn into the opposite direction as a matter of reaction. Sexually, your magnetism and your energy work wonders. You are not complicated and, as long as your slightly domineering nature is respected and you are granted due admiration, all goes perfectly well. You usually have a lot of self-confidence and you believe in you. This characteristic feature may turn you into a hero with Hercules's strength and solar charisma. This text is only an excerpt from of Olga Potachova's portrait. We hope that it will arouse your curiosity, and that it will prompt you to deepen your knowledge of astrology, as well as to visit and use the wide range of free applications at www.astrotheme.com. Your Life Path is influenced by the number 1, Olga, which often prompts you to have an active and sometimes original life. 1 is the number of creativity and indicates individual destinies which are achieved at the cost of personal efforts because, although the path may lead very far, it climbs steeply upwards. You need to learn to manage your life with a strong willpower while using your own resources. It is most likely that you reach the best of your possibilities if you choose a free-lance occupation, or anything which allows a lot of personal initiatives. You really need freedom of action. You prefer to innovate rather than to follow the trend, and to create rather than limiting your activities to repetitive tasks. Thus, your life may be theatre of spectacular twists and turns, all the more so because the more you progress, the more your indecisiveness fades away. In such conditions, it is necessary that you strive to maintain a minimal degree of stability in the course of your life.